The last time I published Thermometer (Rules of Thermometers) was 6 months ago. I provide you 3 easy puzzles of size 6X6 and the last one, a little bit more exigent, of size 9X9. 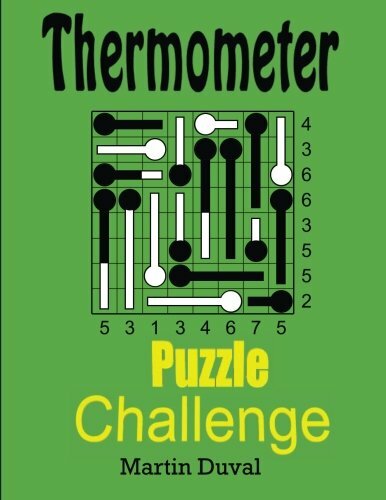 If you want more of this puzzle, you could buy Thermometer Puzzle Challenge 1. with 110 puzzles of different sizes amd levels of difficulty. The thermometer puzzles (Rules of Thermometers) are special puzzles. First of all, like all other puzzles, they required logic and are funny to resolve. But what really distinguishes them from other puzzle is the look of the puzzle : a grid filled with thermometers, which are situated in different positions ,of any size. The grid is surrounded by clues indicating the level of mercury in the corresponding row or column. That’s it. But enough talk, nothing is better than to try it by yourself to appreciate the richness of these puzzles. I provide you 3 puzzles of size 7X7 and the last one, a little bit more exigent, of size 10X10. Today is July the first: Canada Day. So happy celebration for all my Canadians readers !!! As it is the summer and the temperature is high I beieve that it is appropriate to solve Thermometer puzzles. The I have prepared four thermometer puzzles just for your pleasure (Rules of Thermometers).